AssessME.org is committed to supplying our client churches with resources to help them launch and manage AssessME.org successfully. The Kick-Off Kit is one essential resource that has helped many churches to launch AssessME.org successfully with their congregations. THE KICK-OFF KIT HELPS PASTORS LAUNCH ASSESSME WITHIN THEIR CHURCH. 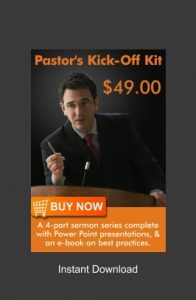 The Pastor’s Kick-Off Kit is an instant download ZIP file which contains essential elements to help your pastoral leadership to launch AssessME.org church-wide. 3) An e-book of best-practices compiled from many successful AssessME.org church clients. Help make your church’s launch of AssessME.org a success with the information you need to kick-start your mobilization ministry effectively. Here is an overview. We do not include teaching that addresses the topic of Spiritual Gifts because of the many different perspectives on this matter….we assume the Pastor can write their own Gifts message (See: Prepared to Serve). This would then make for a 5-week series. TEACHING 2 – Prepared to Serve: (i.e., To be used in conjunction with your own spiritual gifts sermon; Introduce – GraceGifts) Passages Used: Jeremiah 2:11-13; Jeremiah 21:8-10; Jeremiah 24:5-10; Nehemiah 1:1-12; Matthew 25:21; Deuteronomy 7:9; 2 Corinthians 5:14; Various Other Passages.